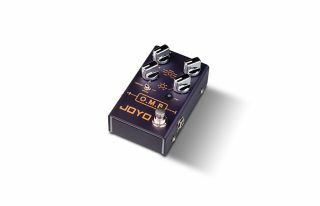 Joyo Pedals has introduced the O.M.B., a looper/drum machine that is the newest addition to the company’s R series of pedals. The O.M.B. functions in looper cycle recording mode, independent drum machine mode and looper-plus-drum mode. In looper mode, the O.M.B. offers 40 minutes of recording time, unlimited overdub capability, auto-align and count-in functions. In drum machine mode, users can choose from seven genres of drum pattern and seven drumbeats. There’s also a tap tempo button, as well as the ability to add fills to drum patterns. The O.M.B. will be available beginning in January, at a price of $109. For more information, head over to JoyoAudio.com.